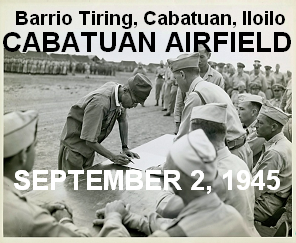 An item was raised yesterday, if there were surrendering Japanese soldiers in Iloilo in September 1945 that were initially processed at Cabatuan Airfield (where all of them were taken to and interned, and where Col. Tozuka signed the surrender instrument in a formal surrender signing ceremony on September 2, 1945). Upon reviewing and analyzing the surrender photos, it's clear that, indeed, some kind of initial processing was done at the airfield. This was evidenced by the arriving Japanese soldiers discarding their weapons and ammos, the subsequent piles of guns and ammos on the ground, and the presence of the processing table (manned by three American sergeants, one an interpreter) where the Japanese soldiers and officers would go to provide information and discard their swords and pistols. "As we made our way to the setting of the ritual, we saw U.S. soldiers feverishly checking out the belongings of Japanese soldiers who descended from trucks. Every one of them had gotten rid of weapons and they were running around in confusion amidst the shouting of U.S. soldiers. The elite troops of Panay already looked quite like POWS." So who could have arrived at Cabatuan Airfield that were not initially processed at Daja, Maasin? As I was going over the American version of the surrender negotiations, which happened in Maasin either on August 28, 1945 (according to the Americans) or August 30, 1945 (according to Lieut Kumai), one thing jumped out on me: "Mt. Singit!" In the negotiations, there were two separate groups that were going to surrender, one coming from Bocari, Leon, and the other coming from Mt. Singit, Lambunao. And the Americans were to evacuate the Japanese from both locations. Certainly, the ones coming from Mt. Singit, Lambunao, were not processed at Daja, Maasin, because Daja would be out of the way. Instead, they would have been trucked directly to Cabatuan Airfield and processed. I then checked Lieut. Kumai's book, The Blood and Mud in the Philippines, for troops coming from Mt. Singit. The chapter on the surrender, Chapter 10, mentions that the Saito Unit was scheduled to surrender on the 2nd day, which was September 2, 1945. So did the Saito Unit come from Mt. Singit? "About 500 men of the Sait� machine-gun force � the Noda unit of the 1st company Company of the Tanabe unit, the Ika H�jin Company, and the Fukutome unit of the 1st Company who joined the others in the mountains � kept moving in the mountains west of Janiuay and Lambunao. They built a position at the foot of Mt. Singit, 11 kilometers west of Lambunao. Only the guerrillas attacked this Japanese position, and there were no major encounters here like those at Bocari." The Saito Force therefore came from Mt. Singit when they surrendered on September 2, 1945. And in all probability, they were the ones initially processed at Cabatuan Airfield. 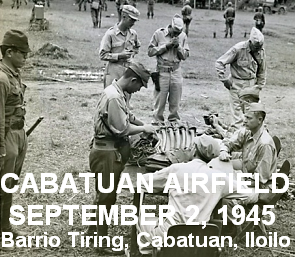 The airfield was called Cabatuan Airfield by the Japanese Imperial Army, after the Municipality of Cabatuan, Iloilo where it was located; Tiring Landing Field by the Panay guerillas of Col. Macario Peralta and the Free Panay Government of Iloilo Governor Thomas Confesor, after Barrio Tiring, Cabatuan, where it was specifically located; Tiring Airfield and Tiring Field by the Americans, after Barrio Tiring, Cabatuan; and erroneously as Santa Barbara Airfield or Santa Barbara Airport by the Americans, erroneous since the airfield was not located in the neighboring town. The Japanese forces operated Cabatuan Airfield the longest, from the time they arrived in Panay in 1942, until they retreated to the mountains in 1945.